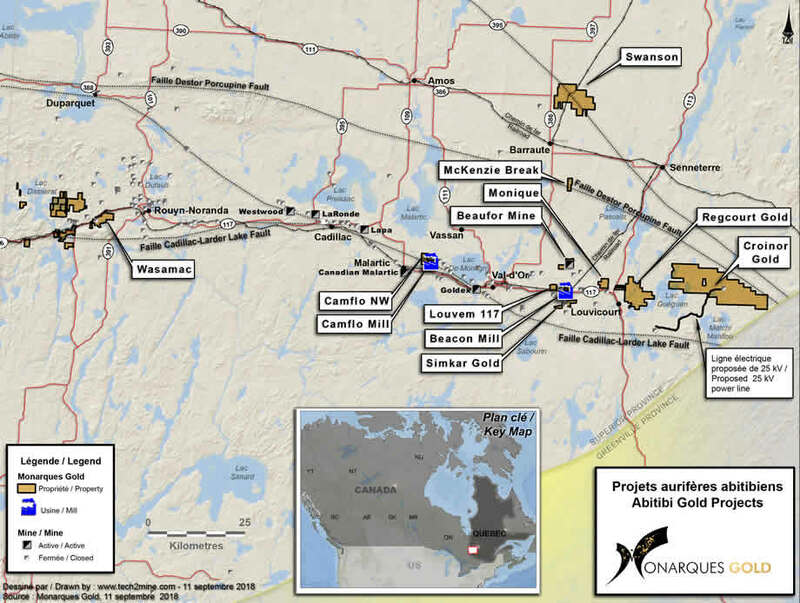 Monarch Gold acquired a 100% interest in the McKenzie Break property from Agnico Eagle Mines Limited (NYSE:AEM, TSX:AEM). The property hosts a high-grade gold deposit that lies just 20 kilometres north of the Beacon mill and 35 kilometres north of Val-d'Or, Quebec. It consists of nine mineral claims covering a total area of 3.3 km2, and is accessible year-round via Route 397 and a gravel road. The property is also about nine kilometres south of the rail link between Barraute and Senneterre. The McKenzie Break property is located in an area with existing infrastructure and several mills. It has surface and underground infrastructure, including a ramp down to a depth of 80 metres below surface. Source: Daniel Gaudreault, Eng., Géologica Groupe-Conseil inc.
On June 14, 2018, Monarch Gold reported the results of a mineral resource estimate for its McKenzie Break gold project. The report was prepared by Alain-Jean Beauregard, P.Geo., and Daniel Gaudreault, Eng., of Geologica Groupe-Conseil Inc., and Christian D’Amours, P.Geo., of GeoPointCom Inc., qualified persons as defined by NI 43-101. The estimate was prepared by GeoPointCom Inc. and is dated April 17, 2018. Scenario 1: A pit constrained Indicated resource of 48,133 ounces and Inferred resource of 14,897 ounces, and an underground Indicated resource of 53,448 ounces and Inferred resource of 49,130 ounces. 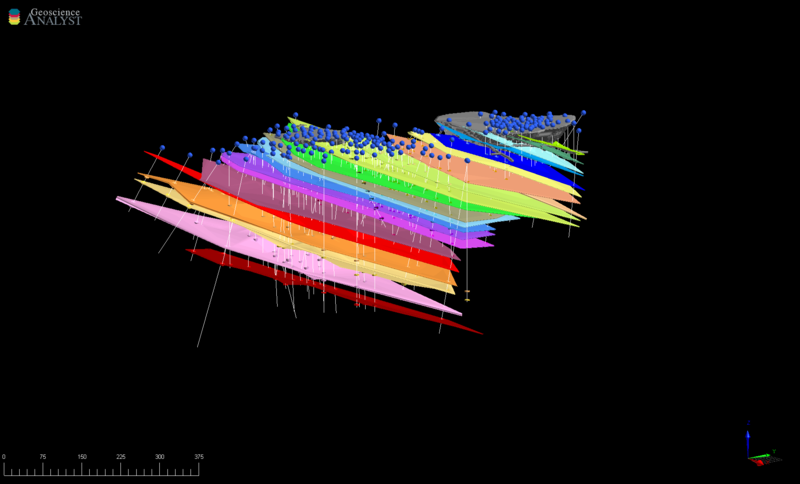 Scenario 2: An underground Indicated resource of 85,059 ounces and Inferred resource of 58,373 ounces. CIM definitions for mineral resources were used. Mineral resources were estimated at a cut-off grade of 0.52 g/t Au for the pit constrained resource and at a cut-off grade of 3.50 g/t Au for the underground resource. Mineral resources were estimated using a 3-year average gold price of US $1,234.82 per ounce on the London market and an exchange rate of US $0.78 = C $1.00. A minimum mining width of 2 metres was used. A bulk density of 2.77 g/cm³ was used. The main Green and Orange zones were drilled on a tight grid to define the resource. The mineralization consists of multiple, narrow and at times anastomosing high-grade veins. Assay results can be erratic due to the nugget effect of the gold. The database contains conventional analytical gold assay results for 258 surface diamond drill holes, as well as coded lithology from the drill core logs (except for the Series WD04 and WD05 holes). This represents 39,611 m of core for a total of 14,758 m assayed core. The database does not include results for QA/QC samples. At least one of the mineralized zones or the potential pit mineralized material covered by the estimate was intersected in 244 of the holes. This represents 3,411 intersections (including 1,817 in the mineralized zone) for 56,141 composites (including 5,488 in the mineralized zone).